President Donald J. Trump has made reducing the U.S. trade deficit, which has expanded significantly in recent decades, a priority of his administration. He and his advisors argue that renegotiating trade deals, promoting “Buy American” policies, and confronting China over what they see as its economic distortions will shrink the trade deficit, create jobs, and strengthen national security. Many economists and trade experts do not believe that trade deficits hurt the economy, and warn against trying to “win” the trade relationship with particular countries. Others, however, believe that sustained trade deficits are often a problem, and there is substantial debate over how much of the trade deficit is caused by foreign governments, as well as what policies, if any, should be pursued to reduce it. 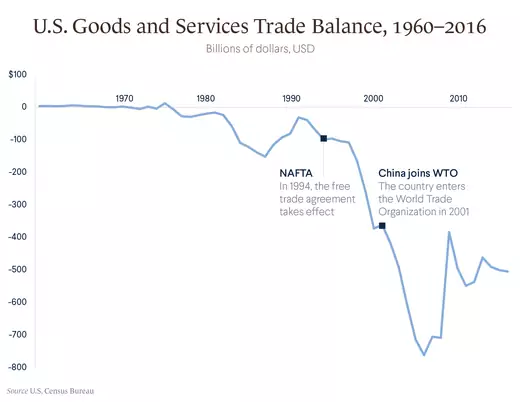 The balance of imports and exports, or the trade balance, is part of the broader measure of the U.S. economy’s transactions with the rest of the world, known as the balance of payments. The economy’s balance of payments consists of the trade balance, or current account, and the financial accounts, or the measures of U.S. purchase and sales of foreign assets. The financial accounts include financial assets, such as stocks and bonds, as well as foreign direct investment (FDI). These accounts generally balance, since a current account deficit—the trade deficit—results in a corresponding financial account surplus as foreign capital and investment flows into the country. The fundamental cause of a trade deficit is an imbalance between a country’s savings and investment rates. As Harvard’s Martin Feldstein explains, the reason for the deficit can be boiled down to the United States as a whole spending more money than it makes, which results in a current account deficit. That additional spending must, by definition, go toward foreign goods and services. Financing that spending happens in the form of either borrowing from foreign lenders (which adds to the U.S. national debt) or foreign investing in U.S. assets and businesses—the capital account. The reason for the deficit can be boiled down to the United States as a whole spending more money than it makes. More government spending, if it leads to a larger federal budget deficit, reduces the national savings rate and raises the trade deficit. A portion of the budget deficit is effectively financed through a rise in the total amount Americans borrow from abroad. The exchange rate of the dollar is important, as a stronger dollar makes foreign products cheaper for American consumers while making U.S. exports more expensive for foreign buyers. A growing U.S. economy also often leads to a larger deficit, since consumers have more income to buy more goods from abroad. Economists generally see these factors as more important than trade policy in determining the overall deficit. That’s because making it easier or harder to trade with specific countries tends to simply shift the trade deficit to other trading partners. Thus, economists warn against conflating bilateral deficits, which reflect the particular circumstances of trading relationships with specific countries, with the overall deficit, which reflects underlying forces in the economy. A roundup of global news developments by CFR.org editors, including analysis from CFR scholars. How has the U.S. trade deficit changed over recent decades? Today’s $621 billion deficit, representing about 3 percent of gross domestic product (GDP), is down from a 2006 peak of more than $760 billion, which at the time was over 5 percent of GDP. The deficit has averaged $535 billion since 2000, much higher than in previous decades, when it accounted for well below 2 percent of GDP. The United States ran either a surplus or a small deficit through the 1960s and 1970s, after which a large deficit opened in the 1980s and continued to expand through the 1990s and 2000s. By far the largest bilateral trade imbalance is with China. The United States ran a $419 billion goods deficit with China in 2018. The next largest contributor to the goods deficit, at $151 billion, is the European Union, followed by Mexico at $81.5 billion, Japan at $67.6 billion, and Malaysia at $26.5 billion. The deficit with China expanded dramatically beginning in the early 2000s from an average of $34 billion in the 1990s. Some economists refer to this as the “China Shock” [PDF] and attribute it to the unexpectedly rapid growth of China’s export manufacturing sector in the late 1990s. This happened as Beijing undertook deep economic reforms and implemented policies to subsidize production, accelerate industrialization, and boost exports. In the process China earned the moniker “the world’s factory.” Economists also note the acceleration of Chinese export growth after the country’s entry into the World Trade Organization (WTO) in 2001. These factors meant a rising flow of Chinese electronics, apparel, and other goods into the United States, which helps to explain China’s contribution to the deficit, as well as the deficit’s concentration in the manufacturing sector. U.S. manufacturing employment dropped from 26 percent of the workforce in 1970 to 8.5 percent in 2016, a fall that Hufbauer and others say was accelerated by Chinese competition. However, most economists attribute the bulk of the reduction to automation, productivity increases, and demand shifts from goods to services. Why are some observers concerned about the trade deficit? Peter Navarro, a senior advisor to the president on trade and industry, believes that the deficit threatens national security in that the United States depends on foreign debt and foreign investment to finance it. The Trump administration made lowering the deficit with Mexico a priority in its renegotiation of the North American Free Trade Agreement (NAFTA). It has also signaled that it will move aggressively to combat practices the WTO considers unfair. One such practice is dumping, in which countries subsidize products, such as steel, and sell them abroad for less than their market value. The Trump administration has also threatened to withdraw the United States from its free trade agreement with South Korea, known by the acronym KORUS, which entered into force in 2012. Since then the U.S. trade deficit with South Korea has doubled and U.S. exports to the country fell by $3 billion, which critics blamed on deliberate policies enacted by Seoul, including currency manipulation and restrictive labor rules. CFR’s Edward Alden says the deal was a “disappointment” since analysts predicted U.S. export growth of at least $10 billion. “South Korea is still a more closed economy than the United States,” he says, “but tearing up KORUS won’t solve that problem.” In August 2018 the United States and South Korea reached an agreement to amend KORUS that included export restrictions on Korean steel and an extended phaseout period for various tariffs. Some Democratic lawmakers, labor groups, and manufacturers also criticize the deficit on the grounds that some foreign countries—especially China—have used unfair practices like currency manipulation, wage suppression, and government subsidies to boost their exports, while blocking U.S. imports. Some economists argue that China’s competitiveness stems from its protectionism and state involvement in the economy, giving its exports an unfair edge and violating global trade rules. Research by Peterson Institute economists C. Fred Bergsten and Joseph E. Gagnon blames China’s “massive and sustained” currency manipulation from 2000 to 2010 for widening the trade deficit to historic levels. Though such aggressive manipulation has eased since then, CFR Senior Fellow Brad Setser, a former Treasury official, writes that there is still an East Asian “savings glut,” in which exceptionally high savings rates in the region, partially due to government policy, drive large trade surpluses, which must be absorbed by deficit countries, like the United States. The deficit has heightened concerns among some economists over job losses and their repercussions in local communities. Meanwhile, the deficit’s concentration in the manufacturing sector has heightened concerns among some economists over job losses and their repercussions in local communities. (Of the $891 billion goods deficit, over $650 billion consisted of [PDF] manufactured consumer goods and automobile parts.) Research by the Economic Policy Institute suggests that the surge in Chinese imports has lowered wages for non-college-educated workers and cost the United States 3.4 million jobs from 2001-2015, while research published by the University of Chicago put that number [PDF] at closer to 2 million over a similar period (1999-2011). Many economists fear that import-related job losses are driving a populist backlash to trade and globalization that will cause political volatility. Some economists worry about the consequences of large and persistent imbalances. The Peterson Institute’s Gagnon warns that the debt necessary to finance the deficit is heading toward unsustainable levels. Former Federal Reserve chairman Ben Bernanke and Jared Bernstein, an economic advisor to Presidents Bill Clinton and Barack Obama, have argued that the large inflows of foreign capital that accompany trade deficits can lead to financial bubbles and may have contributed to the U.S. housing crash that began in 2006. Others note that a growing deficit has been associated with a weak economy, as in the early 2000s, which they say is evidence of the potential for a large deficit to drain demand from the domestic economy and slow growth when the economy is performing under its potential. What are the arguments against focusing on the deficit? For many economists, however, the trade deficit has been scapegoated, and they argue that the trade deficit is not itself a problem for the U.S. economy. That’s because a larger trade deficit can be the result of a stronger economy, as consumers spend and import more while higher interest rates make foreign investors more eager to place their money in the United States. CFR Distinguished Fellow Michael Froman, a former U.S. trade representative, pushes back on the Trump administration’s emphasis that “trade deficits mean you lose, and surpluses mean you win.” He says that Trump’s narrow focus on trade in goods, which disregards the services surplus, is particularly unhelpful. “Every legitimate economist states that measuring trade policy by the size of the goods deficit is probably not a passing grade in a basic economics class,” he said at a CFR trade symposium in October 2017. Economists highlight that the singular role of the U.S. economy in providing liquidity to the global economy and driving demand around the world makes a U.S. trade deficit central to global economic stability. The dollar’s role as the global reserve currency and primary tool for global transactions means that many other countries rely on holding dollar reserves, creating massive demand for U.S. financial assets. This means that the U.S. pays little for its foreign borrowing, allowing it to finance its high consumption at low cost, which boosts global demand. Some economists warn [PDF] that moving toward a U.S. trade surplus could lead to lower global growth and more economic instability among U.S. trade partners, though others believe that high foreign demand for U.S. assets burdens the economy and makes achieving full employment more difficult. Many economists stress that trade boosts the overall economy by lowering prices and increasing productivity. As the Hoover Institution’s Russ Roberts writes, trade, by directing resources to where the economy is most competitive, creates new opportunities and society-wide advances that improve life for everyone in often unforeseen ways. Rather than protecting struggling industries, he says, policy should focus on giving people the skills to compete and flourish in an ever-changing world. Economists also note that traditional ways of measuring economic health, such as gross domestic product (GDP) and trade statistics, have difficulty accounting for the rapid growth of the digital economy and the new types of jobs it created. Economists worry that too much focus on the deficit could lead to a revival of protectionism and a new global trade war. According to CFR’s Benn Steil and Emma Smith, protectionist policies would be especially counterproductive because blocking imports without changing underlying savings and investment levels would simply raise the value of the dollar and cause exports to fall as well, leaving the deficit unchanged but reducing overall trade and making the country poorer. Dartmouth College trade expert Douglas Irwin concurs, pointing to past failed attempts to use protectionist policies to close trade deficits. Others point out that there is no correlation between trade deficits and overall unemployment, suggesting that even as imports threaten jobs in one sector, jobs are created in others. Irwin and others worry that too much focus on the trade deficit could lead to a revival of protectionism and a new global trade war that would make everyone worse off, especially in an era of supply chains that cross many borders. Promises that restrictions on imports from China or elsewhere will revive manufacturing, they say, ignore that technology plays a much larger role in deindustrialization than does trade, and that the U.S. economy began shifting away from manufacturing long before the proliferation of trade agreements in the 1990s. Instead, the Peterson Institute’s Hufbauer counsels, it is better to recognize that the trade deficit is neither all good or all bad, but rather consists of trade-offs: the U.S. economy benefits from foreign goods and investment even as a high deficit displaces some workers and adds to the national debt. What are the options to reduce the deficit? President Trump has promised to reduce the trade deficit, though the administration’s plans remain unclear. Trump’s original suggestion, slapping high tariffs on Chinese goods, would likely be ineffective, but some economists say negotiating better access to the Chinese market for U.S. exporters could help. He also promised to label China a currency manipulator, a designation that experts say would have had few concrete effects, but ultimately changed his mind. Commerce Secretary Wilbur Ross has argued that the problem is high tariffs, subsidies, and other barriers facing U.S. goods in China and Europe. He says that U.S. policy will focus on stepping up trade remedy actions under WTO rules and “making better deals” with trade partners. 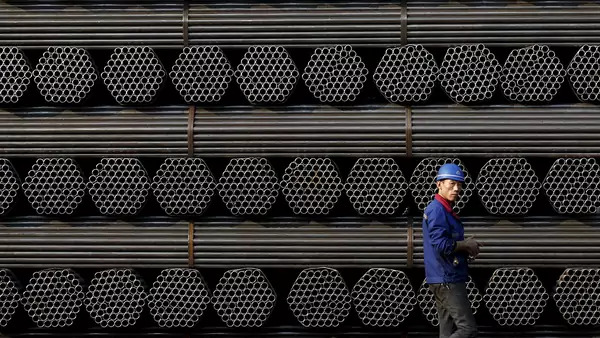 CFR’s Alden has written that unilateral measures to block imports like steel due to concerns over foreign subsidies would likely anger U.S. allies and harm many U.S. industries. However, he says, there is a history going back to Presidents Richard Nixon and Ronald Reagan of U.S. leaders threatening such measures to induce other countries to back off their own trade-distorting policies that Trump might learn from. Nixon and Reagan both threatened allies like Japan and Germany with unilateral tariffs to persuade them to revalue their currencies. A weaker dollar would likely boost U.S. exports. Trump has said he believes the dollar is “too strong,” though he has not said how he might address it, and the dollar has strengthened since the 2017 tax reform. Economic reforms in surplus nations could help. Bergsten and Gagnon argue that the United States should pressure countries that use foreign reserve purchases to manipulate their exchange rates by having the U.S. government counter-purchase the foreign currencies of manipulating nations. CFR’s Setser counsels that policymakers should pressure China and other Asian countries to enact policies that will bring down their savings rates. In the domestic policy arena, boosting the U.S. savings rate could also bring down the trade deficit. As the International Monetary Fund and others have pointed out [PDF], one of the most direct ways to do that is to reduce the government budget deficit. Yet, observers have noted, that is unlikely, given that Trump’s budget proposals have included higher defense and stimulus spending and his 2017 tax cuts further increased the budget deficit. Additionally, the Federal Reserve’s likely increases of interest rates should, as in the past, strengthen the dollar, thus increasing the trade deficit. Dartmouth economist Douglas A. Irwin warns against using protectionist measures to address the trade deficit in this 2017 Foreign Affairs essay. Tariffs on imports won’t help reduce the trade deficit, write CFR’s Benn Steil and Emma Smith in this analysis for PBS NewsHour. The Peterson Institute for International Economics weighs the pros and cons of sustaining a large trade deficit in this 2017 video. CFR Senior Fellow Brad W. Setser explains how excess Asian savings rates are driving global trade imbalances in this report.